Two days ago I finished reading “The Autobiography of Jean-Luc Picard” written by David Goodman and published in late 2017. It is a quick and fun read. 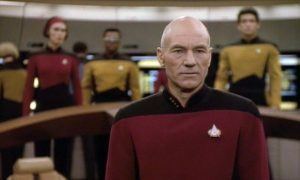 Today CBS announced the return or Jean-Luc Picard in a new Star Trek show that picks up Picard’s life and career post Star Trek The Next Generation. The two stories may end up in conflict – in his biography Picard marries Dr. Crusher and he retires to produce wine in the family estate in France. The biography starts from childhood, through the Starfleet Academy, onto the Stargazer, and eventually to the Enterprise. a tale of court martials, unrequited love, his capture and torture at the hand of the Cardassians, his assimilation with the Borg and countless other encounters. The biography is good on the years that picard spent before the Enterprise – in particular his career on the Stargazer and how the loss of the ship nearly ended his Star Fleet career. It is less detailed in telling the story of the Enterprise – in part perhaps because the tv show and four movies do that. Picard invites Q to his wedding. Q turns up in disguise. And then today’s news: Patrick Stewart is to reprise his role as Jean-Luc Picard in a new series of Star Trek. The CBS All Access series will reveal the next chapter of Picard’s life. Stewart played Picard in 178 episodes of Star Trek: The Next Generation, which ran for seven series between 1987 and 1994. The character also appeared in four feature films: Star Trek Generations, Star Trek: First Contact, Star Trek: Insurrection and Star Trek: Nemesis. Alex Kurtzman, showrunner on 2017’s well-received Star Trek: Discovery, will be an executive producer on the show. Very good news. I will be watching. Will be see the return of Q? Yes please.